This information leaflet aims to help make sure cervical screening is equally accessible to women who have a learning disability or who struggle with written English. The content of the easy guide is based on the information in our standard national leaflet. We have made it easier to read by writing in clear, simple sentences and using photos and other artwork to illustrate each important message. 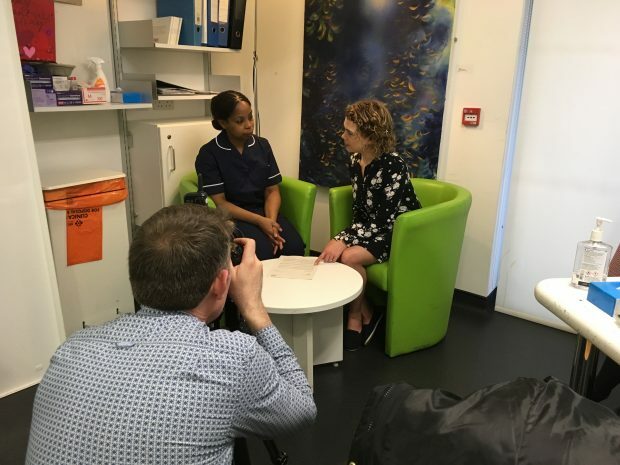 The new resource is called the ‘Having a Smear Test’ easy read guide because service users with learning disabilities told us that they understand the term ‘smear test’ much better than the term ‘cervical screening’. Cervical screening reduces the number of deaths from cervical cancer by finding potentially harmful cells before they become cancerous, ensuring women get the right treatment as soon as possible. Evidence shows that eligible women with a learning disability are less likely to have cervical screening compared to women without a learning disability. This leaves them at risk of undetected cervical cancer. We hope to reverse this trend by working with our partners with the help of the new easy guide and other resources. We developed the new easy guide at a workshop with ‘experts by experience’ from the North East and Cumbria Learning Disability Network. These are service users who require information in an easy read accessible format and means that the people who use the end product are involved in developing it from the very start. We would like to thank Julie Tucker, Macmillan Project Manager for the North East and Cumbria Learning Disability Network Cancer Project, her team and the experts by experience for their invaluable input. Following the workshop we commissioned a photoshoot to make sure we had all the images we needed to illustrate the new easy guide. Primary care plays a crucial role in addressing screening inequalities by identifying women who need additional support, in order to make cervical screening as easy and accessible as possible. Women with learning disabilities can face many barriers to accessing screening, including a lack of understanding which prevents them making an informed choice about whether to accept their invitation. Local screening providers can use the new easy guide alongside our national guidance for supporting women with learning disabilities to access cervical screening. Watch this space for more resources over the coming months. So the NHS screening campaign is all about 'rebranding' cervical screening and not talking about smear tests but screening tests, but the new booklet is all about smear tests. The new booklet also does not mention HPV testing, when HPV Primary testing will come into play within weeks. It does not mention how long roughly results should take. I understand its an 'easy guide' but its also pretty patronising. Our new easy read leaflet helps make sure cervical screening is accessible to women who have a learning disability or who struggle with written English. The content of the easy guide is based on the information in our standard national leaflet, however we have made it easier to read. This version is not intended to replace the standard leaflet and it will only be used when appropriate. The easy read was produced in collaboration with service users with learning disabilities. Great care was taken to ensure the design, colour, use of language and images were appropriate to the intended audience. The new leaflet is called ‘Having a Smear Test’ because service users with learning disabilities told us that they understand the term ‘smear test’ much better than the term ‘cervical screening’.